We have mixed feeling when we look at the R3 Dark project emanated from Spirit of the Seventies' design rooms. As if the Triumph Rocket 3 wasn't already a bike with commanding looks and awe-inspiring on-the-road performance, Spirit of the Seventies thought to add even more menace to the attire of this bike. The result is the R3 Dark, a bike as clean and simple as its very name but which is also an exceptional example of "less is more" excellence. The stock Rocket 3 is a fairly tidy piece of machinery, but the chaps from Spirit of the Seventies literally binned everything that was not mandatory for the ride. R3 Dark lost the passenger seat in favor of a clean-looking rear fender, this the absence of the rear pegs also helps the bike look tidier and somehow, more aggressive. Created as a beast for solo riding, the R3 Dark makes no effort to trick those who remain at home into believing the rider will behave. The rear subframe accommodates a nice leather seat with a fluid shape that is beautifully aligned to other lines on the bike. Its rear end is also swept up and will most likely provide critical lower back support for when the bike will accelerate violently. Also the rear suspension was upgraded with all-black Ohlins shocks, while the new exhausts retain nothing of the stock ones. The nicest thing about the R3 Dark is that it is more than just another cool-looking design people will drool upon online. Just like the wacky Kawasaki Ninja ZX-10R Scrambler by Holographic Hammer we showed to you yesterday, a motorcycle workshop will actually take to building it. Spirit of the Seventies posted this photo online minutes after T3 Racing gave their final okay for the project. This means we WILL see the bike rolling soon. 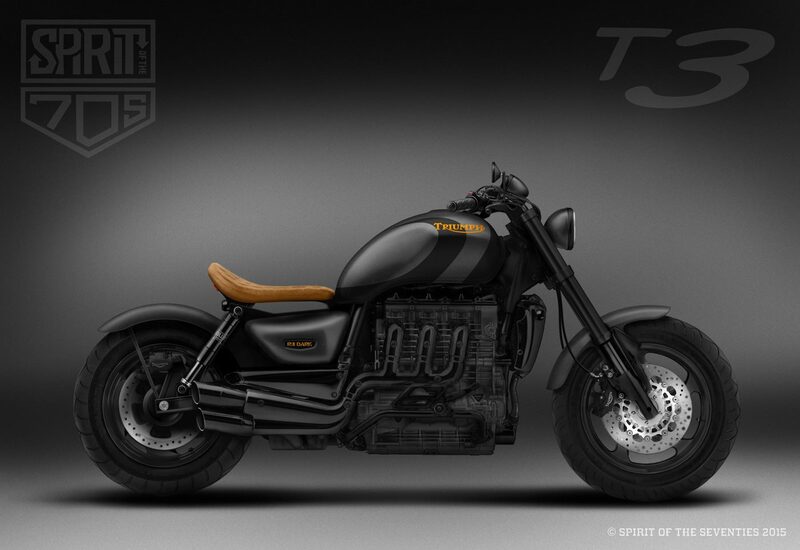 If anything, T3 Racing really seems to be into dark things, as the R3 Dark is an all-black beast. Safe for the tan seat and moderately-sized badges, the bike proudly shows off various types of darkness. From the luscious shine of the black chrome exhaust and heat shields to the sober matte on the side panels, fenders a and tank accents, the R3 Dark lives up to its name. The engine is also blackened out, just like all the intruments, controls, and levers, and, gloriously, the fork legs are ENTIRELY black as well! Though left in their steel sheen, the brake rotors sort of make a nice contrast with the rest of the bike. We have no firm date for the end of the build but we will be all eyes to see it roll. Do you agree with us in saying this amazing project needs a more majestic name? Stay tuned for more pics!